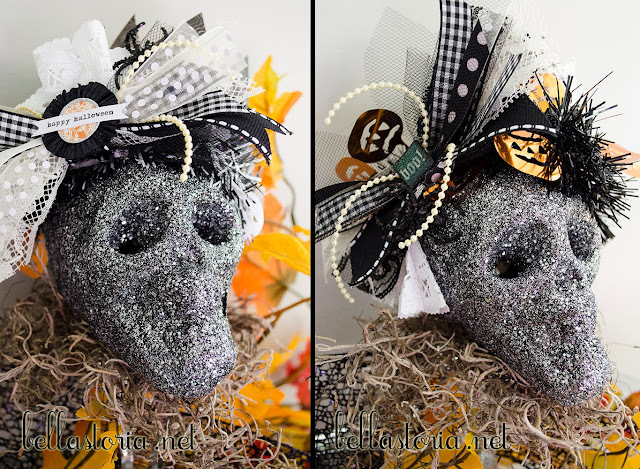 Sometimes you just need a glittered skull or two looming about your house. Am I right? These decked out beauties were made during the Spooky Spark event I was lucky enough to attend last week. Since they are fancy and super thrifty (and since I still haven't gotten around to editing the photos from my white t-shirt refashions - 'thank you' second emergency trip to the dentist in two weeks), I had no reason not to share! I wish I had a full pictorial for your, but alas, I was having too much fun to think about doing that! Ha! But I'll tell you what, it's "super duper uber scooper" easy (per Chloe)! Update: I recreated a couple steps for your crafting convenience. 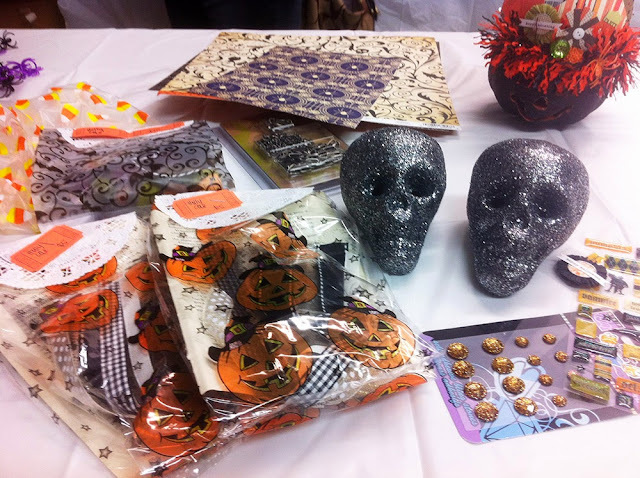 I started with pre-glittered skulls that actually light up - I know! But you could easily buy some dollar store skulls and make your own glitter skulls. 1. 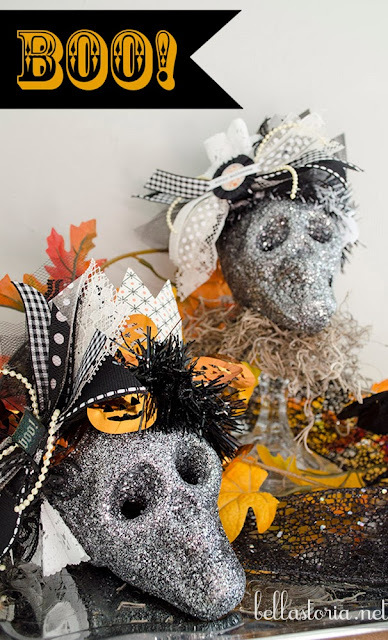 Glitter your skull: Paint Mod Podge or thinned Elmer's glue over entire skull and add glitter. Let dry completely. 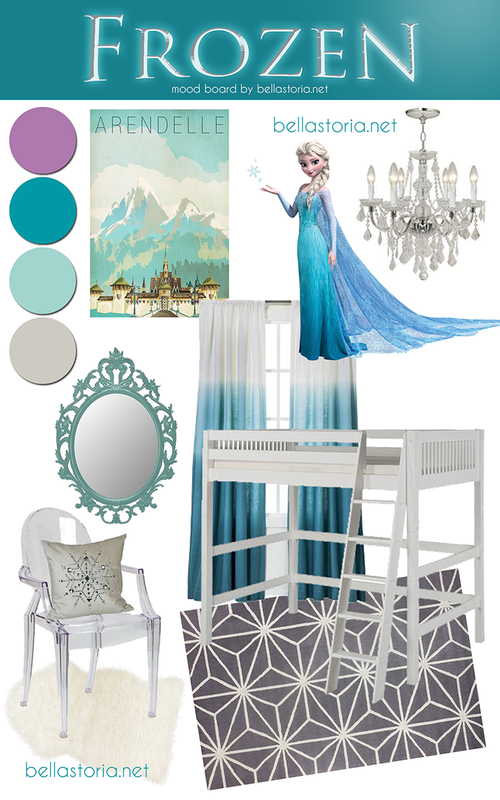 This will be messy, so prepare yourself by sprinkling glitter over newspaper or paper plate. For different effects, you may want to spray paint the skulls first, too. 2. 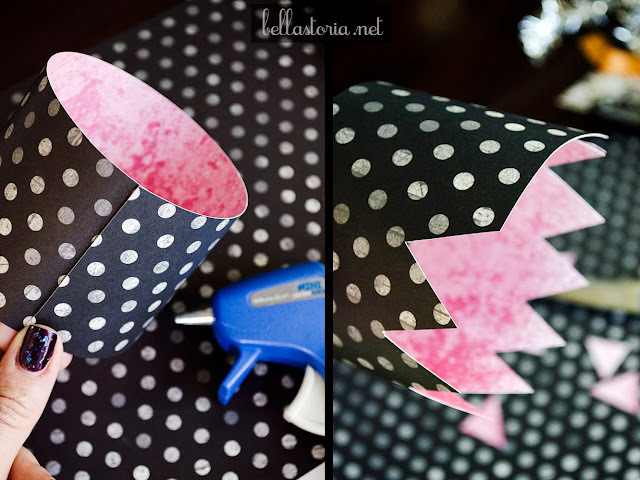 Cut your paper crown: Cut patterned scrapbook paper about 10" in length and 4" in height. I "eyeballed" how wide I wanted the crown then cute to size, adding a dollop of hot glue to secure the ends. You can cut out triangles to create the points in the crown before or after securing the ends. I tried both ways, but found that I liked gluing the ends together then cutting the points where I liked. 4. Add garland: Using a hot glue gun, glue festive garland scrap around base of paper crown. Aren't they looking cute? 5. 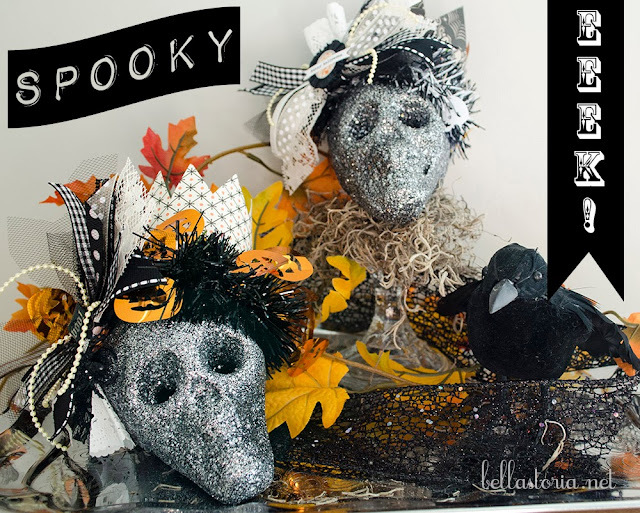 Make junk bow: Gather and pinch scrap pieces of ribbon, lace, pearl strands, tulle, etc. to create a "junk bow" (thanks, Margie!). I used 6" strips for my skulls. Tie gathered ribbon with high gauge (thin) wire or a spare twisty tie. Hot glue a small piece of ribbon (2" length and trim once glued) around to hide the wire. 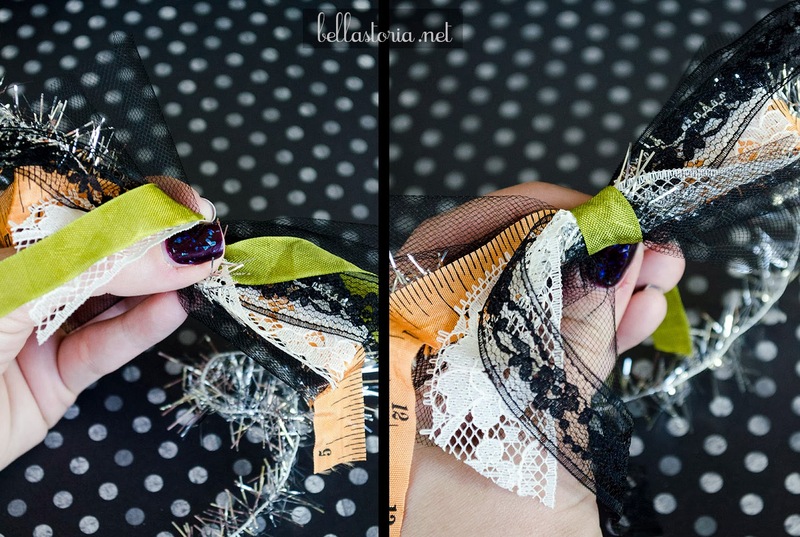 You can also attach a cute button or other embellishment to the center of the bow. 6. Add junk bow: Glue junk bow onto side of glittered skull. Easy peasy! Aren't they fun? I topped a couple candlesticks with Spanish moss and just plopped my fancy skullies right on top. Since I ended up making two, the only thing I would change is switching the bow of one skull to the opposite side...creating a more "bookend" look. I love these! Plus, I'm super grateful I pushed myself to actually make something for Halloween, since it's about the only thing I've got displayed this year!